In emergencies, if you need to contact us out of hours, please phone 07795 433540. Please only use this number for genuine emergencies, for example if one of our vehicles has been involved in an accident or if the bus or coach you booked hasn’t arrived (whether you booked with us or not – we’re happy to fill in at short notice if we can!) Lost property, timetable, and non urgent enquiries should be directed to the office: 01273 681681. Answerphone messages can be left out of hours. Or come round and have a cup of tea with us! If you cannot get to our depot or cannot use stairs (we are on the first floor and regrettably there is no lift) we are happy to meet at a local cafe of your choice, or we can recommend one! i was travelling on the lemon bus today, it left Falmer at 3:00 and believe I left my student ID card on the bus. The name is Tamara Stidwell, and i am a first year student. Do you employ bus cleaners? Currently have 11 years at Brighton & Hove, but looking about in case they get rid of us soon & I wish to keep within the bus industry. I own a small business in Lewes, takeaway and Italian deli, I would like to give you the used oil from my frier, could you please send me information about? My daughter left her mobile phone on your last shuttle bus from City College Wilson Avenue Campus to Pelham Campus. I wondered if it has been found when the driver returned to the depot. If you could check and let me know it would be greatly appreciated. I have left my red purse with all I’d and cards on Brighton Uni shuttle bus. This was just a few mins ago. I got off at the Steine. I’ve tried calling but no answer. Please can you help? Don’t worry, not too many questions! Tickets don’t get sent – they’re emailed so you just show the email or quote the number, you don’t even need to print it. Thanks for getting back to me Tom! I’ve just booked two tickets for myself and my sister and they have been emailed to me 🙂 thank you for that! Just a little worried as it says we are leaving on Wednesday the 21st….really hoping that means the 22nd, as we don’t want to get there on the Tuesday! Should I send you my booking number? A few months ago, I invested in B.L.shares. Will they now qualify for SITR or is it only shares bought now? Do they qualify for Enterprise Investment scheme? Hi Big Lemon, We’re making a short film for the University of Brighton to help raise awareness of a video service for students and staff and would like to film one of our students watching a short video on a bus between campuses. It would be shot over the shoulder with the student seated and estimate we could get this done between the stops of Moulescoumb and Grand Parade. Would this be possible? All done for you 🙂 Sorry you didn’t get through on the phone, we were probably all out driving a bus… but we got the message and have sorted it for you! What is going on with the university shuttle bus service? It’s been very unreliable recently with the 17:45 from Moulsecoomb to Falmer often up to 20 minutes late and sometimes (such as today) not turning up at all! So sorry the bus has been late – I’ve emailed you a fuller explanation but fundamentally the traffic is sometimes impossible to cope with at that time of day – so much so that it’s very difficult to set a timetable that works all the time. Sometimes the journey takes 25 minutes, sometimes it takes 45 minutes… we are doing our best and the Lewes Road bus lane does help but the majority of the delay occurs between Old Steine and the Gyratory. I work for a company that produces E-Leather, a composite leather material used extensively in the bus industry on seating. I’d like to come and talk to someone in your Operations or Engineering about it if convenient. Would it be possible to let me have a contact please. Hi Carl, thanks for getting in touch, we are however already on a programme refurbishing the buses when they are converted to electric, and these refurbishments include the installation of brand new E-leather seating. we can not stop the 2 Buses one after each other so 52 & 57 the magic is the Falmer road the 52 goes onto to Woodingdean and the Temp., Double Deckers New 57 Daily turns right to go to Saltdean. All the hard work is worth is paying off. Well done Bus Driver Kendall advising customers (to transfer to a 7 or 23) at the stop before the Marina turn off on the Evening Fast 52 , that skips the marina in the rush hours etc. As many are still getting used to all the changes. Thank you also Managing Director Norman Baker. Many Thanks , Colin. I am a regular visitor to Saltdean and always use the 47 service to and from Brighton Station. Very disappointed to see that the frequency is now only every 2 hours through the day. I always use the Bannings Vale stop so this now means a walk with luggage to and from Longridge Avenue. And at my age 79 this can be difficult. Sorry to ask you Tom Druitt. (founder of Big Lemmon) Is it not correct to say off peak it is not Every Hour? And for you to tell us what time off peak is??? The Hour it starts , the hour it ends. this what has EVERY user confused on etc? also the last OFF PEAK changes its route. Not every older person can go online sir. A gentleman for East Saltdean moaned at me that you have adjusted the buses in the daytime Off Peak. He was confused. NOT ME . sir. many thanks for your time C.O.L.I.N. adjusted new name to not be confused with poster Colin Day. As a regular user of the 52 I sadly have to register a complaint against my favourite bus service. Since the new timetable began with hourly buses turning at the RSCH,the reliability of the service has become intolerable. With the weather getting into winter can you reasonably expect customers to wait up to 25mins after the due time (All this week). It was much better to have a 90 min service,at least you could generally guarantee that it would be on time. When the service began with B&H the circular journey from Woodingdean to the Marina was timed at one hour. Surely you cannot expect it to run to the RSCH and still stay on schedule especially with works lorries outside the new hospital construction causing delays along Eastern Rd. There is also the question of why there is no service from the Marina after 16.47. 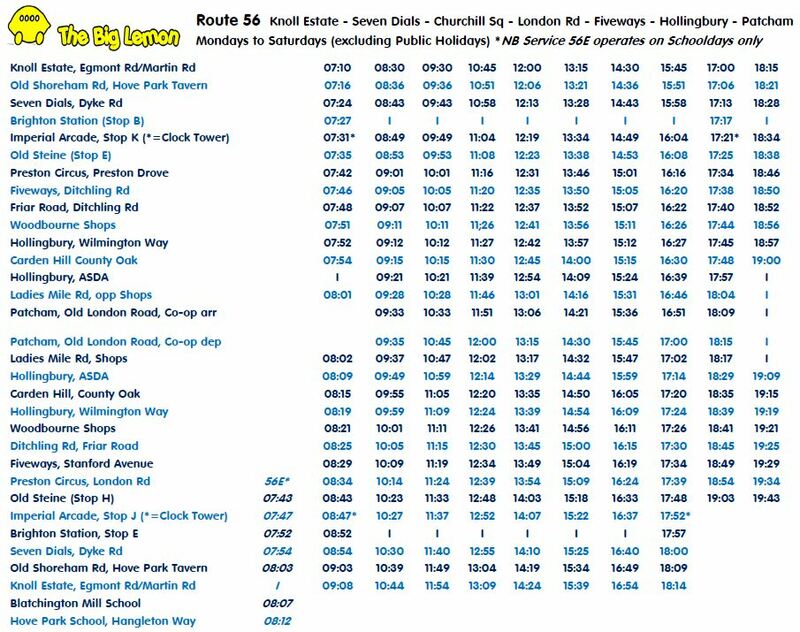 This has left customers of many years who have relied on the later services stranded unless they get a bus up to Bell Tower estate and change (Again,never knowing when the 52 from the station will turn up there). We are still grateful for having this service but hope these are just teething troubles and can be resolved. Thank you for your comments and I hope I can meet some at least of your concerns. The present hourly service to the hospital was specified by the council when they set out the requirements for bidders. I agree however that the timetable is tight so I am proposing a slightly amended timetable from January. This will see the marina served off peak only on the way from Woodingdean to the hospital, so those at the marina wanting to travel to Woodingdean would have a slight diversion via the hospital. We think this will make the hourly timetable workable. We also plan to provide again a service after 5pm direct from the marina to Woodingdean. I have also noticed that you have either got on loan or brought some former London Transport single deck buses for the 47 route, again which give out more fumes. Our coach fleet runs entirely on used cooking oil, which is much less polluting than diesel, enables material to be reused, and helps prevent drains being blocked by chip fat being poured down them. Even though these are greener than the diesel alternative, we want to go further by switching most of our coach fleet to electric propulsion in the medium term. In terms of our buses, we are running the only electric buses in the city, which are also the first solar-powered buses in the country, and the first to be converted from diesel to electric. We have recently taken on a whole swathe of nus routes at very short notice, so had to source what buses we could, but it is our intention to convert all the red single deckers you see to electric propulsion. Hi ,my friend and I took the number 47 yesterday(Friday 10th) at 11.32am from Longridge Avenue towards Brighton Station. The bus driver was ever so friendly and really made the journey enjoyable. A huge difference to the large Brighton &Hove buses.I was hoping it could be passed on as people normally only put in complaints and I thought it might be nice to receive a positive comment. Thank you. Thanks Sue, that’s very kind of you. We pride ourselves on hiring the friendliest drivers to give our customers the happiest journeys. I’ll pass this onto the driver and the team. With very best wishes, Kelly, Development Manager. Unfortunately, I was at the receiving end of some very dangerous driving by one of your buses (number 52, number plate started with ‘pj’ or ‘pg’ and ended in ‘nkk’) riding down Ovingdean Road at around 14:35 today. The bus was coming up the hill, my horse and I were coming down (in hi viz etc). There was a car parked on the roadside the bus was on. I signalled the driver to stop and let me pass, as the gap between the horse and the parked car was way too narrow to do this safely. Unfortunately, the driver ignored this and proceeded to squeeze past the horse with less than a metre distance. Luckily, I have a calm horse – not all are and the driver’s manoevre could have ended in a fatality. I’m sure he had no idea that was he was doing was very dangerous and I find the majority of your drivers excellent around horse riders, but it’d be worth reminding/training them of the HIghway Code when it comes to horse riders. Ovingdean Road is used by quite a few horse riders – we have no other way of accessing the bridle way. Thank you for your feedback and very sorry to hear this. I’ve raised your concerns with Norman the MD so he can speak to drivers to remind them about this. This is really annoying and I do understand that it’s not part of BH buses but still we pay same price to use the service. I called twice to ask what is happening and have been told due to traffic…just wondering how the other buses manage to be on time or even with minor delays. Also if the service is shown on the electronic timetables with minutes would have been great. I am not trying to spam/hate here especially since the drivers are very polite and friendly at all times. That is a simple request for improvement as after hard day at work you don’t need more stress on how you gonna get home. However best of luck. At least I try. Thanks for your feedback. Very sorry to hear you are disappointed, thank you for bearing with us and for the compliments about our drivers, I’ll feed that back to them. Your custom is very important to us & so I’d like to address all of your points individually. – other buses in the city do not always run to time as the real time displays do not correlate with the published timetables. If the real-time display says 4 mins to arrive and it takes 5 then it looks like it is only 1 minute late but in fact it could be 20+. I hope this helps. Merry Christmas Dan. Thanks for your reply Kelly. I have no problem with the price. I just think that you should focus on the buses being on time and the tracking system so customers would be aware shall they wait for the bus at all or look for alternative service. No one expects buses to arrive on the second and minor delays are fine but 10,15,20 min and so on are not. Especially when you miss your train because of the bus delay. Anyway have a merry Christmas all and hopefully 2018 will bring you more happy customers. I am a chemist who is looking to source some bio diesel. I noticed on your website that you obtain yours from a company near Eastbourne. Could you let me know there details please. We now use Uptown Oils http://www.uptownoil.co.uk/ who collect locally and deliver to us here in Brighton. I found by default that you have retimed the No 56 so that the past the hour is different for every hour. I can only assume that you have been asked by the Council to ruin the previously excellent service so that it can be discontinued and no longer be a drain on the Councils coffers.